These green beans have no one dominant flavor. Rather, everything blends together — sherry, garlic, basil and Romano cheese. It simply tastes good. The beans have a special, wrinkly texture from being fried — not pan-fried, but really fried, in lots of oil. 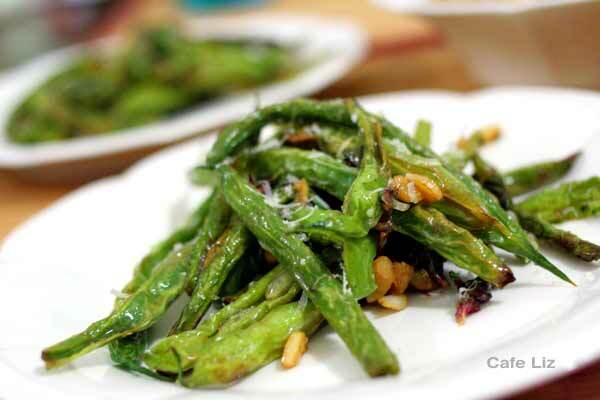 I was inspired by this recipe for Chinese-style green beans on Rasa Malaysia. Anyway, nothing Chinese here — freshly grated Romano cheese, which we bought on our last trip to Italy; a few spoonfuls of sherry from a vacation in Spain (it pains me to do anything but drink my good sherry, but really, you don’t need too much); and some freshly clipped basil from the plant on our patio, flowers and all. 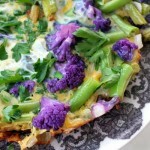 Note: You can make the recipe more healthful by pan-frying or searing the beans with only a small amount of oil. 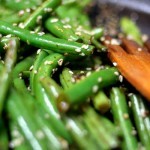 Rinse the green beans, trim off the ends, and dry (nothing worse than dropping wet things into boiling oil). Chop the garlic, and mince the basil. Heat a thick layer of oil in a pan. A wok is good for this, mostly because the curved sides enable you to use less oil. Add the green beans, stirring to make sure they cook evenly, and remove once the beans’ skin begins to wrinkle. Pour the excess oil out of the pan. Put it back on the flame, add the garlic and brown briefly. 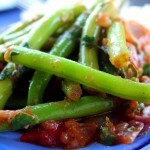 Put the green beans back in the pan, add the sherry and stir quickly. It’ll cook off in a matter of about five seconds. Stir in the basil, and add salt to taste. Serve topped with freshly grated Romano. One Response to "Green beans with sherry and Romano"
I’ve got a ton of green bush beans growing in pots right now, but I can’t tell if they’re fully grown or not (gardening is NOT my forte) and I bet they’ll fall off before I decide…. By the way, I made your fusion Caprese salad last week (but with za’atar instead of sumac and cumin, because I’m just lazy like that). GOD was it ever good. SO GOOD. SO VERY GOOD.